FILE - A man picks up an item belonging to a student at the site of a bomb blast in the university town of Zaria, Nigeria, July 7, 2015. In April 2014, the world awoke to the kind of news that gives every parent nightmares: almost 300 young girls had been kidnapped from a school in the town of Chibok in Borno State, Nigeria. Responsibility for the kidnappings was claimed by Boko Haram, an Islamic jihadist and terrorist organization based in northeast Nigeria. As most of those girls still remain missing, we take a look at the group responsible. Boko Haram is an Islamist extremist group responsible for dozens of massacres of civilians and the abduction of more than 500 women and girls in its five-year insurgency in Nigeria. Boko Haram promotes its own version of Islam which makes it "haram," or forbidden, for Muslims to take part in any political or social activity associated with Western society. The group's formal name is Jama'atu Ahlis Sunna Lidda'awati wal-Jihad, which in Arabic means "People Committed to the Propagation of the Prophet's Teachings and Jihad." But residents in the northeastern Nigerian city of Maiduguri, where the group originated, dubbed it Boko Haram. Loosely translated from the region's Hausa language, this means "Western education is forbidden." A charismatic cleric named Mohammed Yusuf founded the group in Maiduguri in 2002. He set up a religious complex, which included a mosque and an Islamic school, as an alternative to the government schools he regarded as both alien to Muslims and tools of the elite. But Boko Haram was not only interested in education. Its political goal was to create an Islamic state, and the school became a recruiting ground for jihadis. Nigerian government forces struck back with a vengeance in 2009, capturing Yusuf, interrogating him and then shooting him without trial. His body was shown on state television and the security forces declared Boko Haram finished. FILE - This image taken from video by Nigeria's Boko Haram in May 2014 shows leader Abubakar Shekau. But its fighters soon regrouped under a new leader, Abubakar Shekau in 2009. Since then, the insurgency has claimed at least 17,000 lives. Cameroon, Chad and Niger, which all have borders with Nigeria in the Lake Chad region, have all been hit by suicide bombers, often women or adolescent girls, who detonate their devices in crowded places such as open markets. The group has also staged more audacious attacks in northern and central Nigeria, bombing churches, bus ranks, bars, military barracks and even the police and the U.N. building in the capital, Abuja. In 2013, the United States designated Boko Haram a terrorist organization, amid fears it had developed links with other militant groups, such as al-Qaida in the Islamic Maghreb, to join in a global jihad. 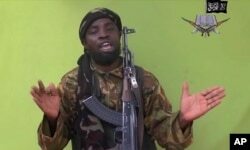 In 2014, Shekau declared a caliphate in areas under Boko Haram's control. "We are in an Islamic caliphate," Shekau said. "We have nothing to do with Nigeria. We don't believe in this name." Later, Shekau formally pledged allegiance to the extremist group known as Islamic State, turning his back on al-Qaida. The IS accepted the pledge, naming the territory under Boko Haram's control as the Islamic State of West Africa Province and declaring it part of the global caliphate it is trying to establish. What is the West doing to help? France has deployed a strong military presence on the ground, with its headquarters in the Chadian capital N'Djamena, set up to fight jihadists in the Sahel. While Washington has reservations about selling arms to Nigeria because of accusations of rights violations by its military, the U.S. military is active in Niger, where it uses drones to watch over the broad strip of Sahel territory on the southern side of the Sahara. The pilotless aircraft will now also be monitoring Boko Haram. The first 90 U.S. soldiers out of a 300-man deployment arrived on Monday in Cameroon, where they will be stationed at the northern town of Garoua. The town is already a base for Cameroon's air force to launch bombing raids against Boko Haram infiltrators. The U.S. forces will carry out surveillance and airborne reconnaissance activities, as well as other intelligence duties, but will not take part in combat. The troops will stay "until their support is no longer needed," U.S. President Barak Obama said in the letter announcing the deployment to both houses of Congress.